All sorts of new trends and evolutions have started a revolution in PR and communication. Ten years ago, most companies were satisfied if they could measure the outcome of traditional PR activities (hello, AVEs!). But today, there is so much more to know and measure. The borders between marketing and communication are fading (hello, PESO!) and the need to measure every detail of the outcome is increasing. But how do you measure this outcome? What do you need to measure? That’s where the Barcelona Principles come in. They offer a framework for measuring PR and communication. Last September, the new Barcelona Principles were presented by the AMEC, the International Association for Measurement and Evaluation of Communication. The ‘old’ principles from 2010 definitely needed an update. Let’s have a look at the 2.0 version. With every campaign, big or small, you need to ask yourself what success looks like. From a holistic as well as a specific point of view (think PESO & tools – you can find a good overview here). Everyone who is directly involved with sales, marketing, communication and management should be aware of the impact of PR and communication on the target group. In the end, the change in purchase behavior, preferences and engagement is what really matters. Unfortunately, it’s a big challenge to measure those things in an organized way. But surveys, research, good internal cooperation and an integrated approach can certainly help you get there. Advertising Value Equivalents are just that. They show the cost of media space, but they don’t give you any idea about the value of the communication. If you do want to include ROI, a Weighed Advertising Equivalent is recommended. It includes the advertising rates, the quality of the coverage and the relevant space of the coverage in relation to the total space. The rules that apply for PR, are also valid for social media. End of discussion. The last principle is pretty straightforward. There is no use in measuring if it doesn’t happen in a transparent, correct and consistent way. This is all great, but how do you approach this in your daily work? That is the question we would like to answer on this blog, including strategic advice and quick wins, practical tips and handy how-to’s. Welcome! PS. 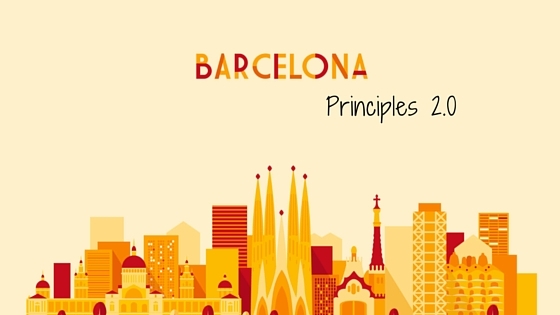 Want to learn more about the Barcelona Principles 2.0? Take a look at the AMEC’s website; they published them in September.